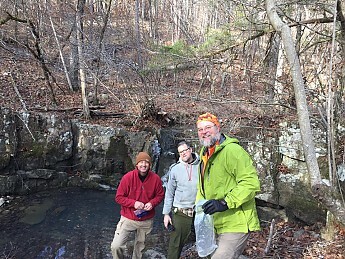 In planning for a 4-day backpacking trip on the Ouachita Trail in Arkansas we noticed a 10-mile stretch with no water supply (with a mountain climb). Looking around this system seemed like it might be the ticket—4 liters, let gravity do the work instead of pumping. Needless to say the morning we hit the trailhead it was snowing with ambient temp of 15°F. The high that day was 22°F. I took the filter from the system and put it inside my shell to make sure it didn't get too cold. When we finally made camp at the beautiful Big Bear Shelter, we filtered 8 liters in about 10 minutes. Fired up the Reactors, JetBoils etc. In 30 minutes we had warm delish food in our bellies after a cold, long day on the trail. The smart move was blowing out the water from the lines and sleeping with the filter in my bag over night. Still the Gray Snap output from the Dirty Bag froze up overnight. I put it in my mouth for about 1 minute or two and it unfroze. Filtered 4 more liters for the long haul up Ouachita Pinnacle and down to Iron Forks. The input line to the Clean Bag has a 90-degree turn. This easily kinks on you and can stop your flow. If you are having flow issues a back flush ( raise the Clean Bag above the Dirty bag to Reverse flow) is usually the solution. The instruction Calls for a 4 second backflush but I usually did at least 30 seconds and backflushed one half of a liter or so just to keep gunk from caking up off the filter. Also there is a small, easily lost plastic cap to close off the Clean Bag. I suspect that if you lose this it would cost some nice coin to replace it. Welcome to Trailspace, James! Thanks for sharing a review of your filter. Got any pictures of yours in use to show others in your review? Welcome to Trailspace, James. I used this system in the Boundary Waters a few years back. There were 6 of us, and we found it worked well for us. Thanks Alicia! Unfortunately I only have one photo from the trail. My iPhone died the first day from the cold weather! Thanks for the picture, James. I hope the iPhone recovered soon after. Used on an 11-day trip to the BWCA and sourced my water right next to the shore. I could literally see little critters swimming around in the pre-filtered water most of the time. After having used an MSR MiniWorks ceramic filter for years, and having been quite happy with it, I was reluctant to part with $129 for this new technology, but it turns out to be one of the best investments in kit I have ever made. You simply fill the dirty bag, connect the inline filter, hang the dirty bag higher than the clean bag, and go do something else for 5 minutes! No more sweating 1/2 liter for every liter of water laboriously pumped through a ceramic filter! 5 minutes later, you return to a clean bag full of crystal clear water. Backflushing is usually as simple as holding the clean bag higher than the dirty bag (thus reversing the flow) but occasionally you need to give the clean bag a bit of a squeeze to force crud out of the filter element. There was one instance where I wasn't able to use this method, and it kinda freaked me out. However, I had a large syringe from a backup filter (Sawyer brand that uses similar hollow fiber tech) which I was able to use quite effectively to push the crud back out of the filter (and it was a LOT of crud). A syringe should be included for the price that this filter costs. The clean bag can be used as a storage bladder, and the spout fits standard caps and nozzles (I think I have Nalgene brand, and they fit just fine). The dirty bag can be used to store dirty water for putting out the campfire when it's time for bed. 11 days, a LOT of water (seriously, it was sooo easy to use we washed up with filtered water just because we could!) and no cooties. Oh, an NO MORE PUMPING (FTW)! Price Paid: Used a REI gift card. I just don't remember. Whatever the going rate at REI is. OMG! Seriously? If you haven't already drooled all over one of these like a lifeless zombie online or in your local shop for hours by now than you've probably already bought one. Here's why you should too. It's perfect in almost every way. Period. NO PUMPING! This is the best part. Hands down. Super fast! This thing is quick. Before you get your cook pot set up it's ready to go. Small. Fits anywhere you want it to. Large capacity. 4 liters at a time is plenty. Really. Versatile. Rig it up with your own bladders. I don't care. Easy to clean. Back wash and done. Hmmmm. I'll get back to you on that. Oh. Not 4-season. You freeze it, you broke it. I could just list everything above in the Pros column but I have to get something in here too. The Platypus GravityWorks Filter is a God send. It filters out everything I'm worried about accidentally ingesting plus... No more endless trips to hand pump out of the stream! No more iodine and chlorine tablets or boiling or any other negative thing any experienced backpacker can come up with when it comes to getting their potable water. It's a drag. Well, no more. Because these guys invented something called "Gravity". Okay. They didn't invent it but they did find a way to harness its power to make backpacking just a little more fun for everyone. I recently bought one of these for myself, but I have been using a friend's for a few trips. Including a couple weeks in Hawaii. Imagine hiking into your campsite and you still have to go a 1/4 mile to resupply your water for the night and breakfast tomorrow. Thinking about having to pump four liters would have been a nightmare. I don't care how good your pump is. But instead you just fill up your four liter bag and off you go to camp. If you wanted to be really nice and bring more back you can sit there and let the filter do its work and when done fill up the "dirty" bladder one more time for later. We often bring a plethora of bladders when we know water won't be close and know we'll be at the same spot for a while. This is convenience at its best. Now, once you've filled the "dirty" bladder through its Big Mouth opening at the top, just zip it up and let gravity do its thing. The instructions tell you to back wash it after a little water comes out of the clean side of the filter. This does work. If you don't the air bubbles will get caught in the filter and stop the filtering process cold. One note about filling the bladder. Bring a little shovel and something to ladle water out of streams just in case you can't submerge the entire bladder. I'd say bring a pump for that too but that would defeat the purpose. Your bladders are full and they're hanging from a tree or post and all you have to do now is use that nifty little plastic stopper to release water from your clean bag directly into your mouth or cook pot, water bottle, over your head or whatever. It's great. The plastic piece is a little odd in its design but very effective. Once you get the hang of it you wont feel like you're all thumbs trying to manipulate its springy latch system. Another cool thing about this filter is you can detach it from the bladders and submerge it directly in water and use it like a straw. There is hardly any resistance from the filter itself. Great for day hiking or whenever your out in the woods. The filter is very light and can be damaged if dropped more than a few feet. You can test it to make sure if you aren't already. Spare filters are like $45 I think. Get one and bring it just in case. It's always good to have a backup. Even better when that backup is the same filter. So this filter is versatile enough for any person on any trip short of excursions where freezing temperatures are expected. Even than, you could probably keep it close enough to your body to prevent that from happening but I wouldn't take the chance. Great product. Great review, I have slightly unrelated question: You mention your cook pot in pros. You don't actually filter your BWCA water before boiling it do you? I mean what's the point of being in some of the cleanest water in North America if you're just going to double-purify it? I usually filter OR boil, and if we're in the middle of a big lake, my dad doesn't do either (avoiding surface water of course). I'm not THAT ballsy myself. I have always purchased Cascade Designs (which Platypus is a part of) products whenever I can because of the excellent customer service and excellent products. They won't be the cheapest product around, but I have an MSR WhispeLite stove, BaseCamp pad, Vela HD quilt, and Platypus water filter. When I got this filter from Amazon it was missing the proprietary connection to one of the bags. I called Platypus on a Saturday and a very helpful (English speaking) person answered and said he would get the part out to me. I received it within the week. Later I managed to lose one of the hoses and fittings. I e-mailed the company and they were a little slow (a few days) getting back to me but in the meantime I found a replacement hose kit. The filter is fast and easy—I always back flush it each time I use it. I have never gotten sick or had any problems after using water I filtered with it. Once or twice it seemed like it got air locked but I just moved/squeezed the bags and it started working again. This is a large filter for a single person, but it is handy to be able to filter that much water at once. The one I ordered did not have a stuff sack/storage bag, which is why I lost the hose (I have since made one for it). I think the ones I have seen online now have a storage/stuff sack included. Welcome to Trailspace, Alan! Thanks for taking the time to share your first gear review with us. If you have pictures, those would be helpful for others to see in your review too. Thanks! Seems great for camping. Good review and welcome! Thanks for the review. We use this in the Boundary Waters on our annual trip. Though it is a little bulky and requires some at home care, this filter can't be beat as far as filtering a lot of water quickly with very little work. To filter water, all you need to do is scoop, set, and relax. When I hike, I normally travel with my husband and my dog. The Platypus filters more than enough water for us. Plus it takes all the work out of the process. All you do is dip the dirty bag into the water source (the bags are labeled in big letters to prevent confusion) and elevate it above the clean bag. The water flows from the higher bag, through the filter, and into the clean bag. Then sit back and relax, but not for too long because it only takes 2.5 minutes to filter 4 liters. The greater the height difference, the better the flow especially at the end. (They call it GravityWorks for a reason.) This filter excels for large groups or when the water source is a trek and you only want to go one. Each bag holds 4 liters, so you can filter 4 at the source, and the scoop up 4 more to filter later. This product meets all EPA & NSF guidelines for the removal of Bacteria and Protozoa, including Giardia, Cryptosporidium, E. coli, Salmonella and Cholera. 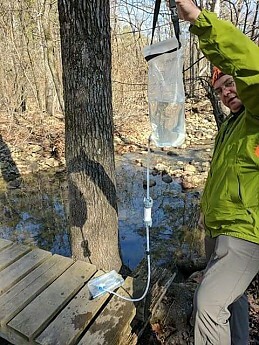 It does not work on viruses, chemicals, or toxins so if your hike is planned for Africa or Chernobyl, look else or pack water purification drops. In my experience, the Platy does a great job clearing up water, and significantly lightens up rusty, leafy water. If the water is really full of debris, I would recommend pre-filtering with a bandana or the like before running it through the filter. This will help prevent clogging, as with any filter. The two bags roll up together with the hose and filter and come with their own little stuff sack. I normally store them at the top of my bag so there's no chance of a hose getting creased. They're probably more durable than I give them credit for, but I do try to treat them with care. Cleaning them out after the trip is a little more difficult. The filter itself is really easy - give it a quick back-flush and you're good to go. The dirty bag is also easy because the top opens completely like a zip-lock. Just stick a paper towel in and wipe it out, then dry it. The clean bag is where the pain lies. It opens with a normal sized bottle cap, so in order to get it to dry completely, you must blow into the bag and find a way to keep sides of the bag rom pressing together. Once the bag is worn in, it gets easier through. I have had this filter for year now, and its still looking and working well after full season of use. I'm excited to use it again this summer, I usually only go on 2 or 3 day trips, so I cannot speak to its durability during constant use, such as on a long trail. If you are a solo hiker, this filter is probably overkill. Platypus makes a smaller model that only has a dirty bag, and then filters into a water bottle. This might be a great consideration if you don't need the volume. This water filter is definitely the best thing going. This water filter is definitely the best thing going. I have been on numerous multi-person hikes and it keeps everyone in water no matter what the situation. It filters 4 liters of water in minutes and is very easy to use and clean the filter. There is no pumping...just scoop up 4 liters of water and hang both bags. It is as easy as that. In less than 10 minutes you have 4 liters of water. It weighs about the same as most pumps. It filters 4 liters of water virtually effortlessly. It is so easy to clean the filter. The only con I can think of is that sometimes the "pinch" seals at the top of each bag are tough to close with cold hands. I hike between 50 and 150 miles each summer in the High Sierras. I have been hiking about 15 years, and in that time I have used many water purification methods (iodine, pumps...). The first trip into the backcountry with the Platypus, I was completely sold on it. It was a trip with five other people. We hiked 60 miles over 6 days. During the trip, hiked all day and camped near water each night. 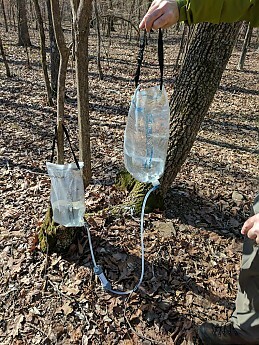 Each night as we entered camp, the first thing I did was take out the Platypus Gravity filtration, scoop up 4 liters of water in the "Dirty Bag" (labeled), hang this bag above the "Clean Bag" and open the clip allowing water to flow. Then I went about my business setting up my tent. Before I was finished setting up my tent, the system had already filtered 4 liters of water and everyone was able to drink. We transferred the 4 liters into a bladder and were able to filter more as we needed it. This experience is typical of every time I have used this system. While hiking, some of the hikers have gotten low on their individual water supply. I stopped with him, took out the Platypus system, and we were back on the trail within 6-7 minutes. He completely filled his Camelbak in that time. At least four of my hiking buddies have purchased this system after experiencing it with me. I have had this system for about three years now and it has never failed. With no working parts, or small pieces which can easily break or become lost, It is perfect for any size group. The only negative I can think of... pinching the bags closed so water doesn't spill out. When it is very cold out, pinching the "zip-lock" tops of the bags is difficult with cold fingers. The ease of use though, GREATLY outweighs any small negatives such as this. This is an excellent filtration system. In my mind, water purification is the toughest place to find the perfect piece of gear — chemicals take too long and muddy up the taste of delicious mountain water; filters break, clog, slow down, and take too much effort at the end of a long day, UV systems run out of batteries and the bulbs break. While this isn't perfect, it's a great piece of gear to have available. I bought the CleanStream before leading a group of 9 people, including several new backpackers, on a long trip into the Sierra Nevada. I figured the large capacity and ease of use would be helpful with such a large group, and it came through. All you have to do is fill it up, hang it, and then ignore it, and you'll shortly have a big bag full of clean water. I've only had the CleanStream for about 6 months and it's already filtered hundreds of liters of water with no issues at all. Downsides: As another reviewer noted, the zip closures can be surprisingly difficult to seal. It begins to run slow fairly quickly, and backflushing is a bit finicky. But these are minor problems — the benefits of such an easy-to-use system far outweigh my minor gripes. This filtering system is the best I've used. I am an ultralight backpacker, and I've carried and used this filter in all four seasons. It is uncomplicated and filters a lot of water very fast with no work our your part...fill it and hang it. If you cannot find anything to hang it from, the ClearStream filters fast enough that you can just hold it up until the water moves from the "Dirty" side to the "Clean" side. The only drawback I've found is that the "ziplock" style closures are a bit tough to seal and even more so in cold weather. However, once you get them zipped tight the water does not leak out. I love this filter. I have owned other filtration systems before but nothing that worked this well and was this simple to use. It's light weight, clearly marked (one bag is marked clean and the other dirty), fast, and most importantly the water gets clean with no weird taste. Oh and filtering 4 liters at a time in under 3 minutes doesn't hurt either. I can't think of anything bad to say about it. 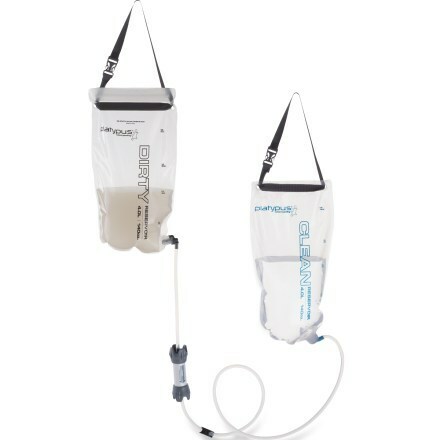 If you're looking for a lightweight effortless way to provide water for your group of hikers the 4.0 liter system is just the system for you. Super easy to use and can provide up to 8 liters of water for the group in one trip to the water source. Effectiveness: Treats water from natural sources and have not had any issues with it not performing as advertised. You do need to read the directions, which are not difficult to follow or remember even at 12,000 feet after a hard climb. I have used all types of filters from carbon filter pump models to the super lightweight individual squeeze bag filters. This is my go-to system from now on. Was deciding on the 4 or 2 liter model, went with the 4 and glad I did. The extra few ounces is worth it for the ease of getting 8 liters of water so easy. Speed: Didn't time it but the filtering was very acceptable. Even if it took a minute longer than advertised, which I doubt, it would still be worth it because of the ease of getting that much water so easy. 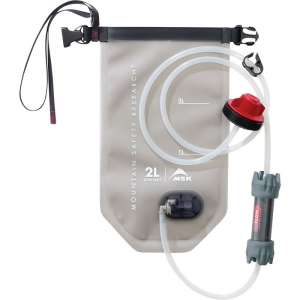 Capacity: With the 4 liter system you can treat 4 liters into the clean bag and then fill up the dirty 4 liter bag and head bag to camp with 4 clean and 4 dirty ready to be filtered when needed. Super easy. I used this on a trip with three thirsty hikers in Sierra Nevada mountains and it worked super. Ease of Use: Fill the dirty bag up with water and hold it or put it on a rock or tree higher than the clean bag and let gravity do its work. If you get air bubbles or it seems to be flowing slow at first just lift the clean bag higher than the dirty bag to backflow the filter and the issue is quickly cleared out and off it goes. Durability: Survived being hung from trees, placed on granite rocks, etc all over the Sierra Nevada mountains and never stopped working. Filter is well protected with a protective cover and the bags and hoses showed no signs of wear. Thanks for the helpful review, Broughpa. 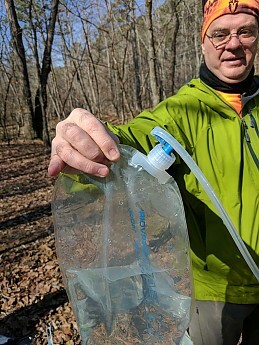 What gets better than being able to filter dirty stream water into clean drink water in less than 2 minutes and you're getting 4 liters of it at once in a carryable bag. The bags are very thick and durable as well as the rest of the materials for the filtration unit. The filtration system is so easy to use you can pull it right out of the bag and start to use it. Everything is labeled clean bag, dirty bag, which way to filter the water through the filter and so on. When you're done using the unit just roll the bags up unhook the hoses from the filter and throw everthing into your pack and you are ready to keep on trekking. I wouldn't get anything else this is extremely practical and efficient to use on the trail. Any such thing in the market as a 'flow through' ultraviolet system? Super easy to set up, use, and take down. Set it and forget it. Packs really light! Only problem my team had was keeping the closure cap with the system. This filtration system was very effective in filtering water for six people for a three-day overnight camping trip up to Lake Lovely Water. It took approximately 45 minutes to get 3 litres of filtered water to each member for their hydration packs (18 litres total) and it was easy and fast and we were able to ready our packs while we filtered. It was easy to constantly refill (without having to stop the filtering process) and didn't cause any hassle. The only downfall I had with this product is the closure cap that the system comes with is easy to lose. So far I have only used this filter in British Columbia for the last year and so far the durability of the system has been great! I will be changing the filter before our next trip. Welcome to Trailspace, Alexa! Thanks for sharing a review. This product works!!! The 4L Platypus is utilized best when the need to produce large amounts of water is necessary. I would recommend this or its little brother to anyone who requires the need to filter water effectively and efficiently from water sources that does or may contain bacteria. We used this on a five-day float down one of Alaska's premiere rivers. Though the river itself is as clean and pristine as you would like any river to be, at the start of the trip, we floated by a decaying moose carcass that eerily appeared to be standing completely under water ghostlike at the headwaters as if still alive. This is a river that is full of decaying salmon carcass as they reach the end of there life cycles. Our biggest concern though, are the abundance of beavers that occupy the 45-mile stretch of river we use. The effectiveness of this product stands up to all it claims to do. Not once did we hesitate in using filtered water to drink and cook with. Because the river itself is already fairly clear, there was very little difference in clarity from unfiltered to filtered. Being able to filter 4 liters in a matter of a few minutes is a major bonus for this product. Using canoes this past year, our water supply came entirely from the river. We were able to filter a days worth of drinking water effortlessly in comparison to our old hand pump/attach to a Nalgene bottle system. Most importantly, no illnesses were to be had. Weighing in at just under 12 ounces and very compactible, it would be just as ideal for a backpacking trip as it would for a float. The plastic bladder material seems to be durable and resistant to punctures but like anything else, use common sense and care as to how and where you store it. This is an unbelievably easy to use low maintenance system. Be sure to back flush as required and service the system as outlined in its manual and you will not be dissatisfied. The Platypus came highly recommended from one of the outdoor survival schools in Alaska. I have used mine here in Alaska for the past two years without ever having a problem. Welcome to Trailspace, Nick. Thanks for sharing your filter review with us. 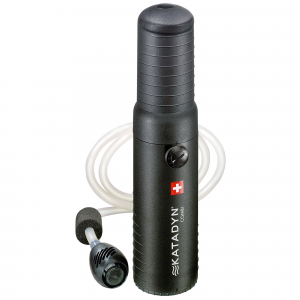 The Platypus gravity filter is fast small and light. It packs in its own mesh bag. It uses gravity, so no pumping is required. Just fill the dirty bag and hang from a tree rock or trekking poles and open the valve. You don't need to attend it at all. It's fast and produces clean clear delicious water. 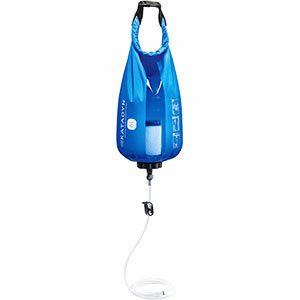 The system comes with fittings to fill popular water carrying bottles, or you can filter directly into your hydration bladder. One of the easiest and quickest way to filter a liter of water. It's so rad to let gravity do its work while you start preparing breakfast or dinner, or setting up camp. Easy to back flush and stores nicely in the accompanied Playtpus bag. I can't say enough about my Platypus GravityWorks system. It makes filtering water one of the "funner" chores of camp, which we all know that sometimes filtering water can really be a chore. I love the process and how easy it is to hook up. I hang my dirty water bag up and then move on to another chore of camp while letting gravity do its work, or sometimes I'll just sit in my hammock and grin as I watch the clean water bag fill up. Yep, it's that easy. Another bonus—I won this along with some other awesome swag from a Platypus contest they had on Instagram last year, awesome company and just as awesome products. Great water filtration whether going solo or out with the family. Ease of use makes for a great value. 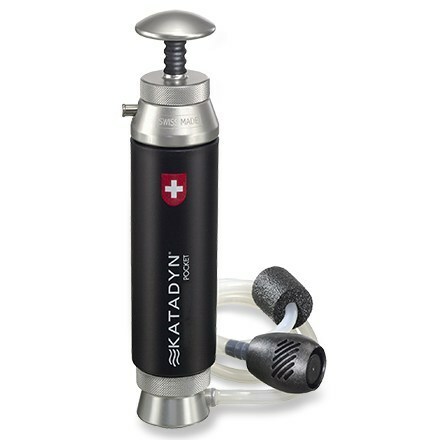 I bought this water filtration system to carry in my pack when I have my wife and son with me. The ease of being able to hang your water while it filters itself and complete other tasks is a great value. The whole system fits nicely in my pack and is relatively lightweight, adding 10.75 ounces for the 4 liter kit that I bought. Some may say that's a lot, but my favorite mountain home in WV has no water on the top of the 29 mile mountain. The bags allow you to carry an additional 4 liters of clean water as well as 4 liters of dirty water to filter. The frequency of back flushing is overcome by the ease of doing so. Funny you posted this, Wes. This morning on FB someone was proclaiming that hikers can't use gravity filters. I politely disagreed, stating I know many hikers who use them. Thanks for the review! 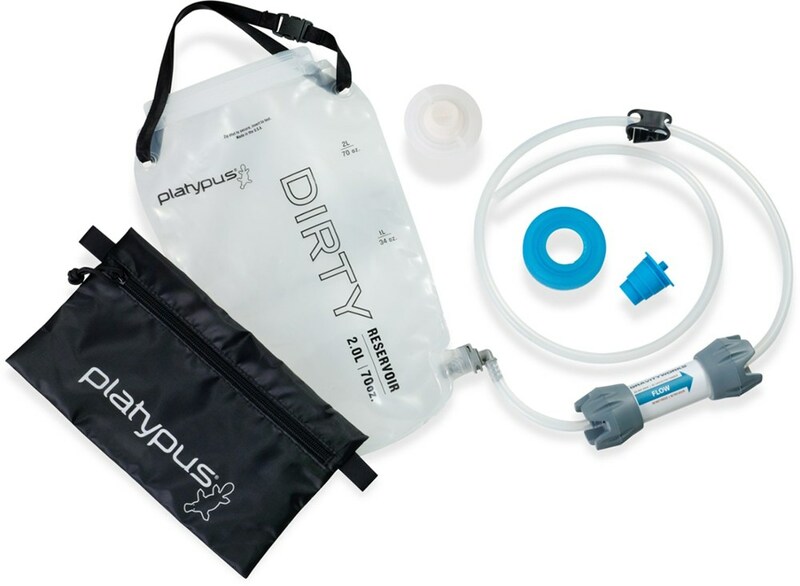 If you need lots of clean water fast, the Platypus GravityWorks filter system is for you. As the High Adventure coordinator for my scout troop, I often take groups of boys into the wilderness for true backcountry camping experience. The GravityWorks helped us get back on the trail quickly many times. You can filter 4 liters of water very quickly, get everyone re-hydrated fast and get all bottles topped off in no time. We have used it while canoeing and you can even filter while paddling with the correct setup. I have filled up and kept it in camp with 4 clean liters and another 4 ready to go in the dirty bag. System rolls down to a small size and is relatively light. I have used this system now for three summers of canoeing hiking and backpacking. One time I had problems with the filter but later realized it was my own fault as I had not reconnected the hose properly. I always have purification tablets as a secondary system and fire as a third backup if needed, but prefer the filtered water best. Welcome to Trailspace, Don! Thanks for the review. Great filtration product for groups of 1 to 6. Leave the pump home and save the workout for the gym. This easy-to-use filtration system is long over due. The glass filament filtration is fast. We often backpack with 3 to 6 in a group. The chore of manning the filtration pumps was always one of the dreaded chores. The GravityWorks system filtered water for 5 days for a group of six. Not once did we have to resort to the use of PolarPure iodine or boiling to keep up with demand. Like any filtration system, GravityWorks should not be allowed to freeze, the expanding ice crystals will crack the filtration pores. Similarly, prefiltration of turbid water is helpful for extending filter life. I usually carry a handkerchief for this purpose. The back-flushing of the GravityWorks filter was effective for clearing the contaminants. This was a please to use without the pain of squatting at the creekside. Just scoop the water, check for floaters, hang, and wait a couple of minutes. Works well with clear water. Took one of these on a 93-mile trip of the Allagash River in Maine. Worked very well for the first several days and had worked well during our shake downs. The high mineral and vegetation solids water of the rivers and lakes that make the Allagash challenged this after several days even with proper back flushing and care when filling the dirty water bag. Ended the trip using an MSR ceramic pump system. We had to clean the ceramic filter frequently, but we still made water for 15 people.